lt;stronggt;SAF2463SLlt;/stronggt;lt;BR/gt;Safco Cha-Cha Bistro Height Table Baselt;BR/gt;Slim and sleek X-style design adds elegance to the tall and elegant bistro-height tablesmaking them perfect for a change of pace, giving users the option to stand or take a seat. Add them to meeting spaces, gathering areas, breakrooms, eating spaces and casual work areas to help fuel workday productivity. Leg levelers ensure table doesnt wobble on uneven surfaces. Top and Base sold and shipped separatelyORDER BOTH. 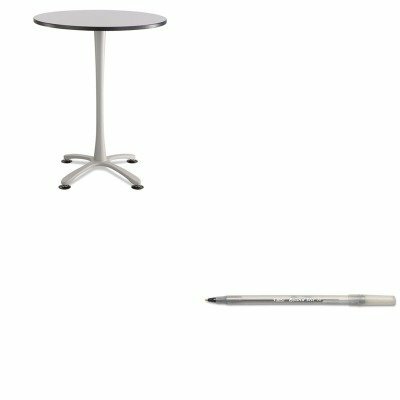 Base Color: Silver Height Maximum: 42amp;quot; Base/Leg Material: Steel Base Type: X-Base.lt;BR/gt;lt;BR/gt;lt;stronggt;BICGSM11BKlt;/stronggt;lt;BR/gt;Safco Cha-Cha Bistro Height Table Baselt;BR/gt;The economical choice for performance and reliability. Colorful frosted cap and translucent barrel for visible ink supply. Flexible round barrel for writing comfort. Long-lasting: more than 7,200 feet of writing in each pen. Pen Style: Stick Ink Colors: Black. Balt - Split-Level Computer Training Table Base 72W X 36D X 33H Gray/Black (Box Two) "Product Category: Office Furniture/Meeting/Training Room Tables"
Hon - Huddle T-Leg Base For 24" And 30" Deep Table Tops Black "Product Category: Office Furniture/Meeting/Training Room Tables"
Hon - Huddle Series Post Leg Base With Casters 1-3/4W X 1-3/4D X 28-3/8H Black "Product Category: Office Furniture/Meeting/Training Room Tables"
Alera - Valencia Series Training Table Top Rectangular 35-1/2W X 23-5/8Dspeckled Gray "Product Category: Office Furniture/Meeting/Training Room Tables"